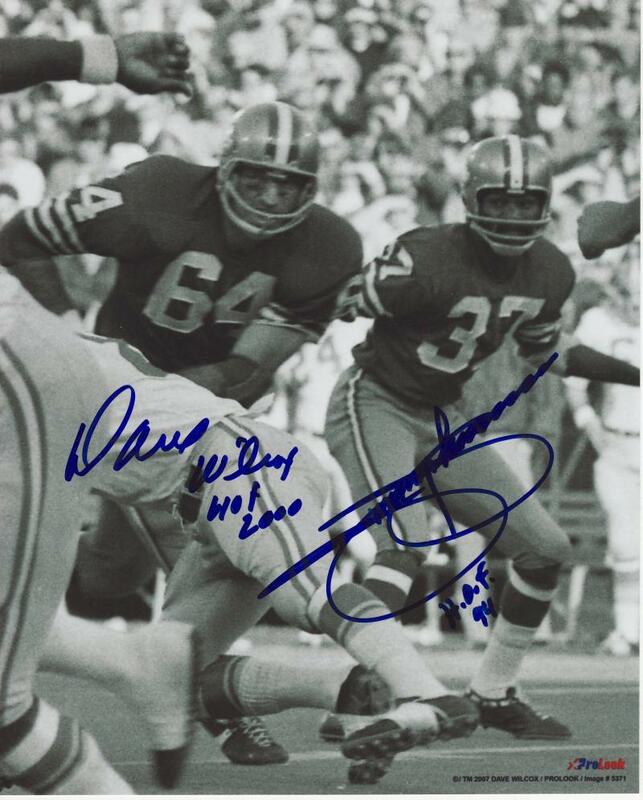 Dave Wilcox & Jimmy Johnson San Francisco 49ers Autographed 8x10 #316 with HOF Special Inscriptions | Sports Memorabilia! This is a great looking autographed photo by 49er Hall of Fame Members Dave Wilcox and Jimmy Johnson. This black and white photo has that "old football" look. Dave Wilcox has added the special inscription "HOF 2000" and Jimmy Johnson has added the special inscription "HOF 94." There are stories behind this photo. Dave signed the photo first and told us how Jimmy always to told him to get out of this area and go someplace else. When Jimmy saw this photo he told us that he would tell Dave to go someplace else because Jimmy could not see the man in motion's feet coming his way. Funny how they both made the same comment. Did you know that Jimmy Johnson was Dave Wilcox's best man in his wedding!